The dental office is open all year. You will find us directly at the Paseo Maritimo in Port de Alcudia. One focus of our work is the holistic dentistry. For example, acupuncture reduces anxiety and pain. It is my responsibility to locate the interactions between teeth and organs and so to help my patients to be more healthy. 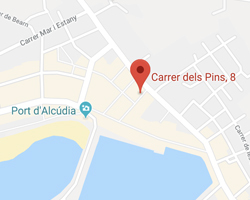 Dental problems in Mallorca? No problem! We also treat tourists with health insurance. Since 1998 Dr. McKenzie has been established in her dental surgery in Port de ´Alcudia. From A for Acupunctur to Z for Zirconium- Implants- you can find all types of treatment here. Of course, we help you quickly and uncomplicated with acute tooth problems, so that you can continue your holiday with beautiful and healthy teeth. Your well-being is our priority. You will receive an invoice which you can simply submit to your health insurance at home.